four square walls: blue. minoru. v2. 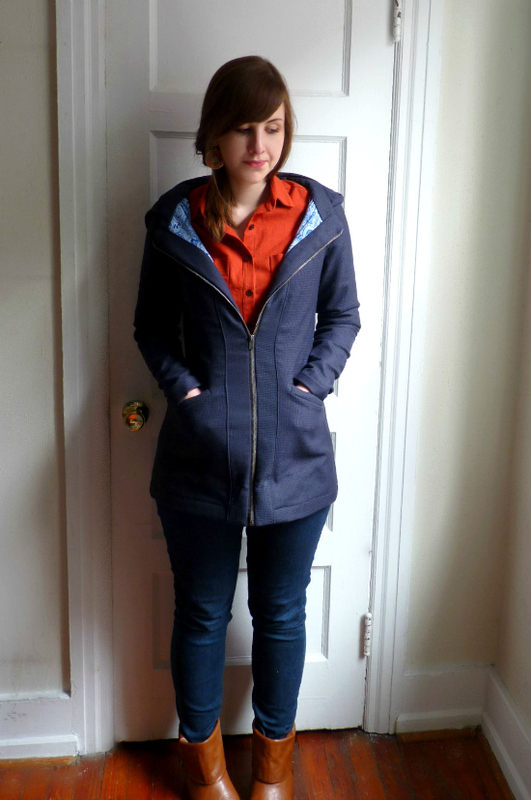 Minoru Jacket v1 and I were two peas in a pod. We went everywhere together and saw all the sights. We held each other close when the weather turned bitter. Many people IRL commented on Minoru v1, always impressed by how well we complemented each other. Minoru v1 saw me through my long-distance-relationship and a job change and a significant out-of-state move. 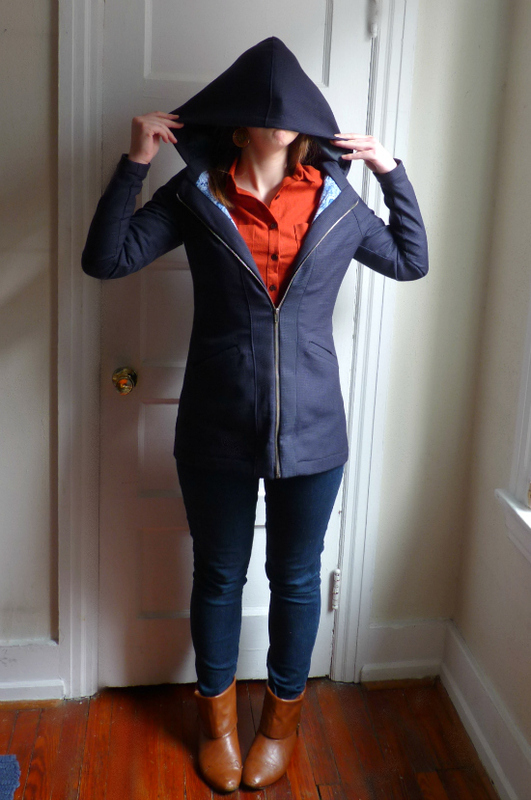 It was my first handmade jacket, my first creation of substance with a clean finish and flattering fit, and probably the project that started regularly bringing traffic to my blog and turning visitors into followers. Then, one gray day in October 2012, on my way home from the Philly airport after a weekend away, Minoru v1 escaped from my loving grasp and took a tumble off the train platform into oblivion. Or something. All I know is that I had it on the train but then it didn't make it home with me. And that was that. Of course, I exaggerate for the sake of storytelling. Minoru v1 was a decent jacket, sure, but it's not like I slaved over tailoring techniques for months or anything. I knew I could remake a Minoru in a matter of days with inexpensive materials and it would be all good. And it IS good. I like my new jacket. I still wonder, though, where did that other little guy end up? Anyway, you may have noticed I modified the pattern a bit this time around. I was a little TOO inspired by Mika's most recent version, and when I'm TOO inspired I just downright copy ya. 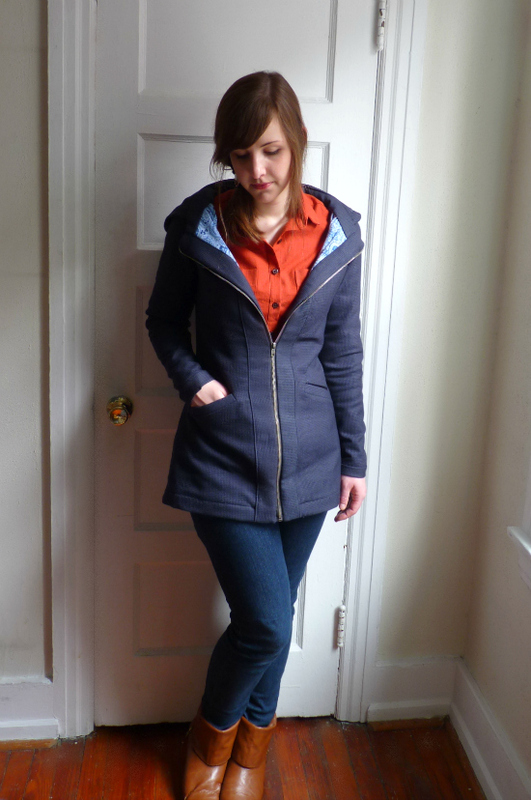 I liked her diagonal welt pockets in the front, and I liked the way she attached the hood to the collar piece, and I liked how her elastic waist didn't wrap all the way around the jacket, and I liked that she changed the cuffs to non-elastic. So, you know, I just did it all. I even e-mailed her asking about the shape of her pocket bags at the welt (thanks, Mika! ), so I think she could already tell that I was a big fat Minoru plagiarizer. And now I have proof. 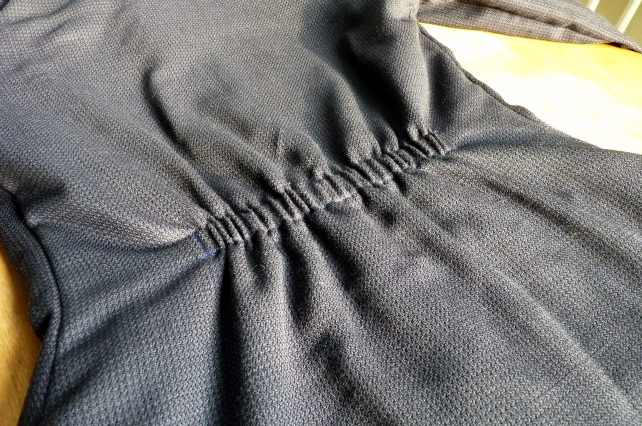 These are my first single welt pockets evar. I followed Poppykettle's tutorial for them, which I certainly recommend. However, I first sewed mine on right-side-to-wrong-side of the jacket, which I didn't notice until AFTER I had sliced them down the middle. After some Instagram sobbing (what, you don't turn to your tiny friends living in your phone at a moment of crisis? ), fray check dabbing, stitch unpicking, and deep breathing, I got em all squared away. The pocket bags are kind of small but I can ball up my fists in them, fit an iPhone, my usual million tissues. I'm a snot-nosed child, if you didn't know. The jacket shell is made from some lightweight wool suiting from Jomar in Philly. Last month this fabric was actually halfway to becoming a Colette Anise Jacket. I made four bound buttonholes and everything, guys. I decided I didn't like the Anise, though (seems to be the theme with my Colette patterns lately), and so I switched plans to Minoruville. Off topic, but does anyone know how to pronounce Minoru for real? Min-o-roo? Min-ORR-oo? The wool is loosely woven so I fused some ProWeft Supreme Medium Interfacing from Fashion Sewing Supply to the entire shell. 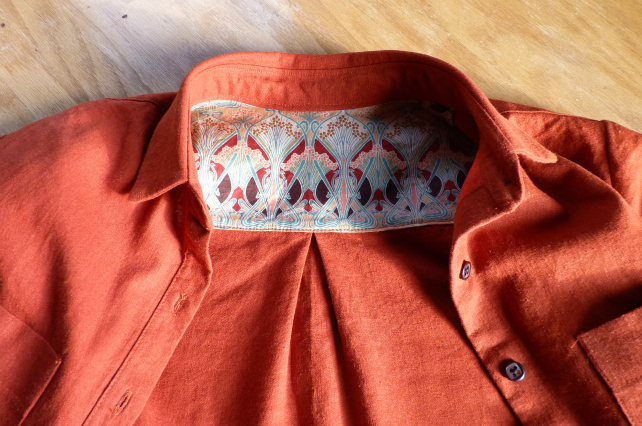 This interfacing is like a baby blanket; it's wonderful to the touch. 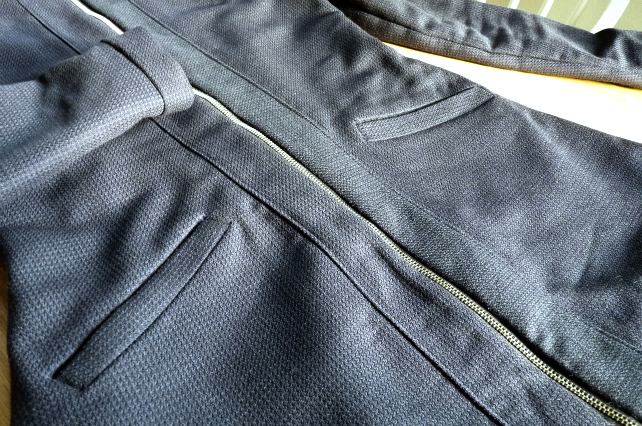 It really doesn't like staying fused to my fabric, though, so there's constant bubbling at the zipper placket. I wonder if it's too heavy for my fabric? 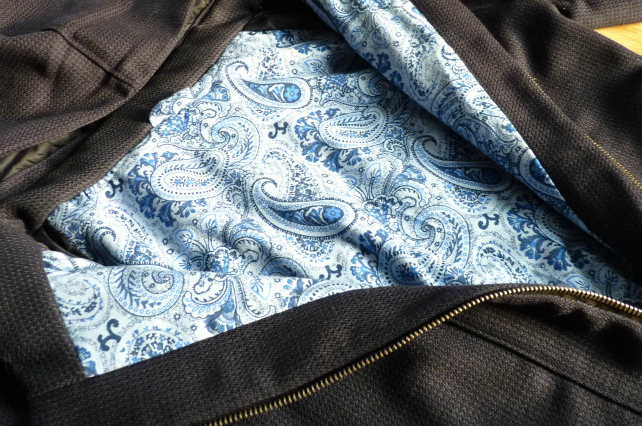 The lining is vintage cotton in a blue paisley print that my sweet boyf got me from Etsy for my birthday. The print is not my usual style for a blouse or dress, but I thought it would work well here with the navy jacket. I only used it on the front and back lining pieces. 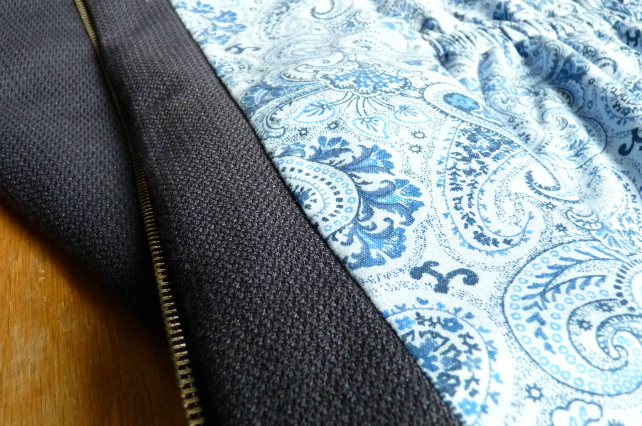 The sleeve lining is bemberg rayon so the jacket is easier to slide on and off over long sleeves. 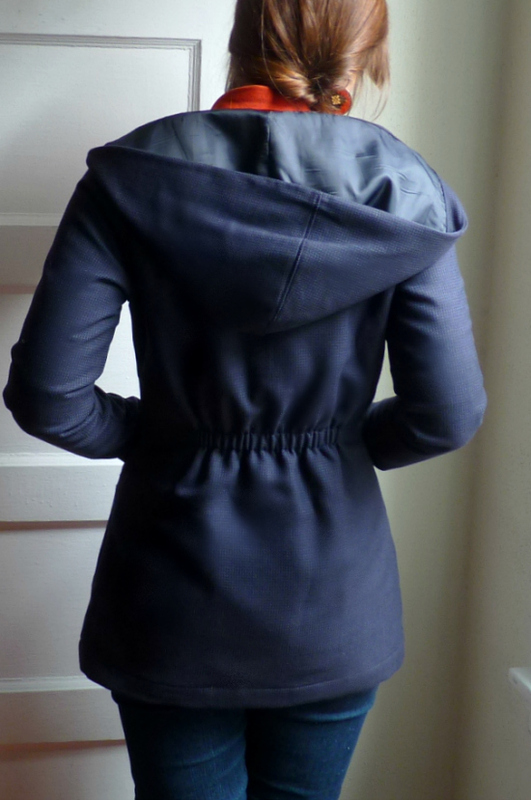 I'm still not crazy about the elastic in the back, but the jacket had to have some kind of waist definition or I was going to look back-pregnant. I tried copying Mika's idea here, too, with the tab and buttons. I couldn't sew a decent looking oval-shaped tab for the life of me, though. 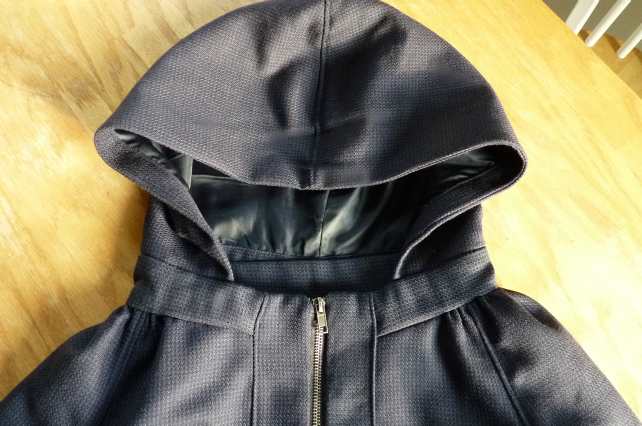 I used the same hood pattern piece as is, improvising ways to attach a lining and connect it to the collar. It's wonky on the inside (long story) but looks fine on the outside... except the hood is HUGE. I guess most people who've made the hooded version of the Minoru already know that. It tends to fall in my eyes as I walk, but I actually prefer that to it falling off the back of my head entirely. Who needs vision while walking through city streets? I could be done now, but what blog post of mine is complete without a new Archer shirt to show you? 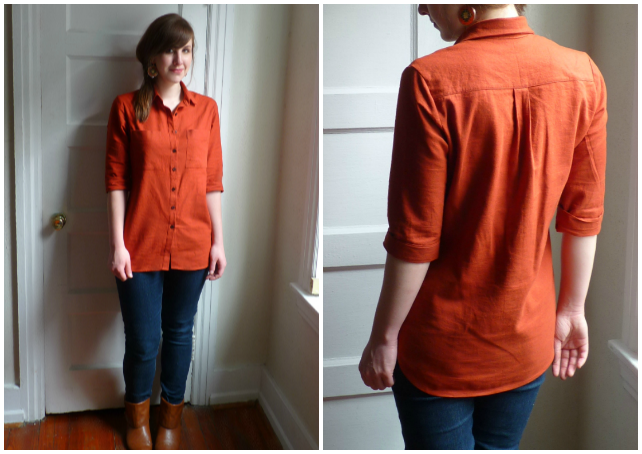 This is my second of three Archers so far (first here and third here): an orange linen version that I wear obnoxiously often. I made a couple changes, like lengthening it, curving the side hem some more to make room for my hips, doing a tiny swayback adjustment, and facing the yoke with a cotton print because of fabric limitations. I only had enough fabric to make half-sleeves, so there are no cuffs. 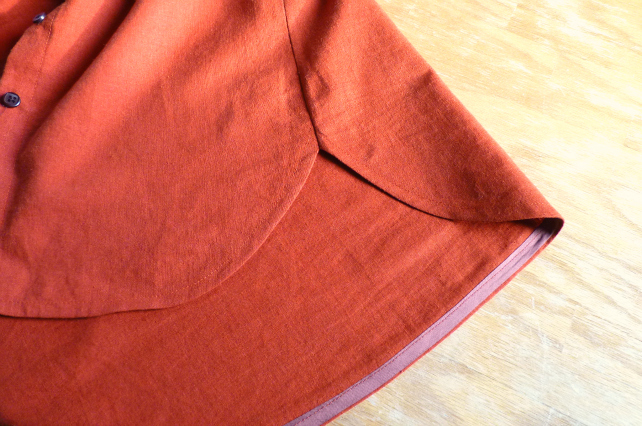 I used French seams on the side and underarm seams because I wasn't about to buy orange serger thread and I knew I would want to roll up the sleeves and expose the seam. P.S. I'm still pretty chuffed that I know what French seams are but Richard from freakin' Project Runway didn't. Home sewers: 1. Fashion designer wannabe reality show divas: 0. So, I like my Minoru a lot, but since I finished it, the weather went from winter coat temperatures to sundress temperatures within a matter of like four days. 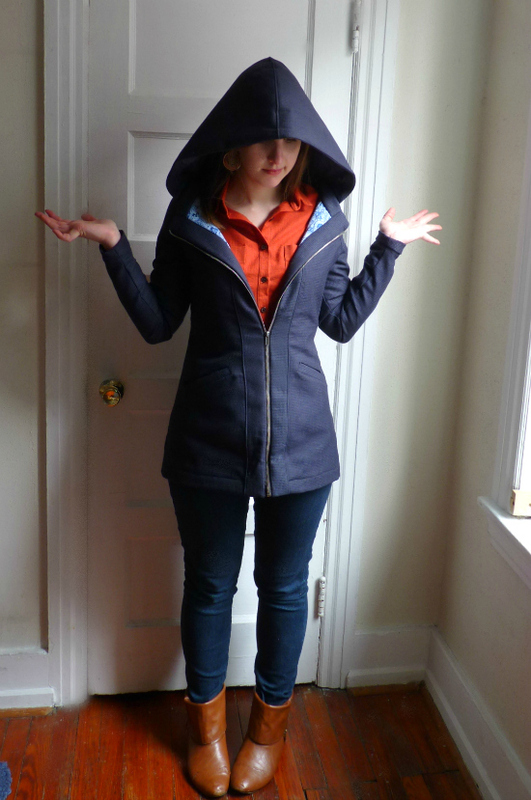 This is supposed to be a spring jacket -- wtf earth? Climate change is bad news for the polar bears as well as the slow seamstresses. How can I plan my spring wardrobe if suddenly spring just doesn't exist in the northeastern USA? Bah. How's your spring sewing going?